The new Mercedes Benz E-Class Sedan has been around for some time, but recently the arrival of the 2017 Mercedes Benz E-Class Coupe has some of the driving enthusiast fraternity interested. Turbocharged E200 and E300 coupe models and a bi-turbo V6-powered E400 4Matic coupe are some of the special models becoming available to buyers, and don’t you just love the flowing exterior lines! It’s nice to have the arrival of the 2017 E-Class C238 generation coupes here in Australia which is based on the E-Class sedan platform. A cabriolet model is also available for those who like wind-in-the-air motoring. This new E-Class Coupe has plenty of room in the rear for a relaxed and comfortable ride for two adults. The Coupe design is a genuine four-seat cabin dressed in elegant leather trim and premium luxury features. Having grown 123 mm longer than the outgoing model, the new design has a wheelbase that has been extended by 113 mm, which translates to a plusher ride and more room in the cabin. 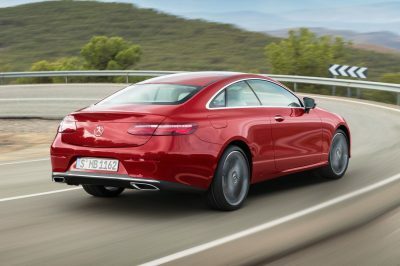 The E-Class Coupe is also 74 mm wider and 33 mm taller, and this extra substance gives a bolder road presence. Deep, sculptured flanks and an extended roofline flow sweetly together, and the aggressive bonnet lines and purposeful expression create a powerful coupe profile. 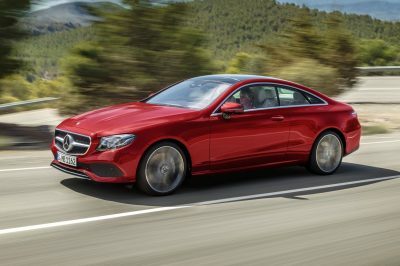 Not only has the new Mercedes Benz E-Class Coupe grown in size, the coupe sits 45 mm lower than the new E-Class saloon, and in place of the twin horizontal bars running through the grille of the saloon, the face of the coupe features the diamond pin grille highlighting to capture onlooker’s attention. At the rear of the car slim-line rear light clusters finish the back end off nicely. A drive in the new E-Class Coupe certainly appeals to passers-by. Settle yourself into the new E-Class Coupe, and the increased exterior dimensions yield more rear legroom, headroom, shoulder space and elbow room. This rear seat is reclining, and with plenty of luggage space the car becomes a very practical tourer. Drivers will appreciate the electronic adjustment of both the seat and steering wheel. Coupe models also get automatic feeders for the front seat belts and stylish turbine- inspired air vents – features not available in E-Class sedans. Standard equipment across the E-Class Coupe line-up includes the comprehensive driver assistance package plus an active safety system, the widescreen cockpit display, dual-zone air conditioning, active park assist that uses a 360-degree camera with senses, nine airbags, command online connectivity, and keyless locking and ignition start. Blind Spot monitoring, active cruise control and city emergency braking systems come as very useful features that make up a five-star EuroNCAP safety package. Base model 2017 Mercedes Benz E-Class Coupe variants are equipped with the very good, and economical, E200 model equipped with the 135 kW and 300 Nm 2.0-litre direct-injected turbo petrol engine. You also have the amazing new nine-speed 9G-Tronic automatic transmission for extra smooth and luxurious driving. The E-Class E200 Coupe has more distinction than the E200 Sedan, with an AMG exterior and cabin enhancements, 19-inch five twin-spoke alloy wheels, illuminated door sills and leather upholstery standard features. If you require more power, then the Mercedes Benz E300 Coupe has the punchier 180 kW version of the 2.0-litre engine with peak torque of 370 Nm for extra performance. The E300 Coupe adds a sports exhaust system to the E200’s list of equipment along with a new 84-element multi-beam LED headlight system, auto high beam, heated front seats, 20-inch AMG multi-spoke alloy wheels and the air body control air suspension system. To drive, the new E300 Coupe is brisk and powerful with plenty of torque available for all driving needs. In this guise, the Coupe will complete the 0-100km/h sprint in around 6.4 seconds – which is rather brisk. Until a new AMG E-Class Coupe arrives, the flagship E-Class Coupe will be the E400 4Matic Coupe, still with plenty of herbs under the bonnet – without the full force of an AMG engine. The 2017 Mercedes Benz E400 4Matic Coupe houses the 3.0-litre V6 turbo engine with 245 kW of power, and 480 Nm of torque. Boasting AWD, the ride and handling for this model is sublime and totally intoxicating. With all this power and grip, the E400 can whisk up to 100 km/h from a standstill in only 5.3 seconds. Finishing the 2017 E-Class Coupe range is the excellent new E220d, and we all know what the ‘d’ means. It stands for diesel, and so the E220d Coupe has all the lovely luxury of the E300 except with colossal wide torque range that comes from the state-of-the-art inline 4-cylinder 2.0-litre turbo-diesel motor. From very low revs, the E-Class Coupe Diesel packs 400 Nm of torque. Even peak power is 143 kW, making the drive satisfying. Of course, you get the added bonus of boasting the best fuel economy of all new E-Class Coupe variants, and with acceleration that completes the 0-100 km/h sprint in less than 8 seconds, you will swiftly get to your destination in loads of style and efficiency. Very elegant and striking on the eye, 2017 Mercedes Benz E-Class Coupes, though worth some money, are very satisfying cars. For any more information on the latest Mercedes Benz E-Class Coupe models or, for that matter, any other new car, contact one of our friendly consultants on 1300 303 181. If you’d like some fleet discount pricing (yes even for private buyers! ), we can submit vehicle quote requests out to our national network of Mercedes Benz dealers and come back with pricing within 24 hours. Private Fleet – car buying made easy!